Can we use stereo vision with ARKit to estimate floor plans? When it comes to refurbishing your home the first hurdle has to be accurately measuring the room. Whether you stretch out the measuring tape yourself or seek the help of a professional, the process is extremely manual and mistakes at this early stage can be costly. By using cutting edge technology, however, we believe that people, like you or me, will soon be able to scan a room using a mobile phone to seamlessly create an accurate floor plan. There are many ways to acquire 3D information, and in our previous blog post, we presented an overview of the most commonly used techniques. Although we have lots of experience with devices that generate 3D information such as Google Tango, Kinect and Structur Sensor from Occipital, these devices arenРђЎt compact enough to carry around. As such our research is focused on smartphones equipped with ARKit and ARCore, which provide visual-inertial SLAM capabilities. Estimating the structure of a room from a scan involves a number of steps. WeРђЎve already written about how to compute a floor plan starting from a 3D Dense Point Cloud, but now want to focus on how to retrieve this information. In this blog post, weРђЎll analyse whether stereo vision, coupled with ARKit or ARCore, can be used to obtain a 3D Point Cloud of a room and the challenges associated with this approach. WHAT DO WE MEAN BY STEREO VISION? Stereo vision is based on the concept that, pretty much like human vision, two different images of the same scene are sufficient to gather an idea of how far away objects appear in a scene. ThereРђЎs lots of information available on this and multiple methods which encompass Visual SLAM, Multi View Stereo and Structure from Motion that can be used to approach the problem of estimating geometry from images. A few notable examples are: DTAM, LSD-SLAM, CNN-SLAM, Bundler and PMVS. 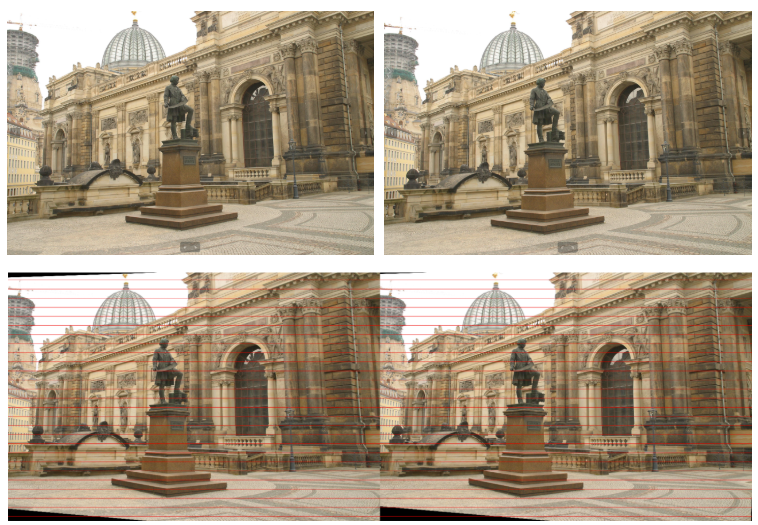 However, in this blog weРђЎre only talking about the classic stereo vision pipeline. 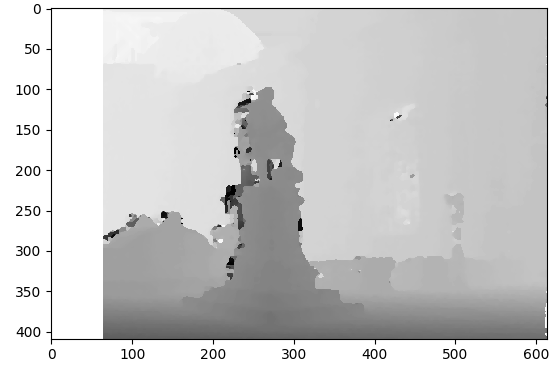 In particular, given two rectified images, it is possible to find correspondences between the two images and estimate a disparity map, which, for calibrated cameras, can easily be transformed into a Dense 3D Point Cloud. LetРђЎs first explore quickly what all of these terms mean. If you donРђЎt want to get too deep into the theory, you can skip to the next section! Rectification is the process of transforming both images to project them on one common plane, as if the cameras were parallel (see Fig. 2). This process allows easier and faster search for matches across the images. Fig. 3 shows an example of how two images look before and after rectification. After the images have been rectified, itРђЎs easier to look for correspondences: for example given a pixel in the first image, where is the corresponding pixel (the same 3D point projected on the second camera) in the second image? Correspondences then allow us to compute the disparity map. In particular, disparity is the distance between a pixel in the left image and the same pixel in the right image. This set of distances can help us understand how far objects are: in fact, given two pairs of corresponding pixels, we can say that the pair with the smallest disparity corresponds to a point which is farther away with respect to the point represented by the pair with the greater disparity. Fig. 4: Disparity map computed from the two images in Fig. 3. Fig. 4 shows an example of a disparity map, where closer pixels are darker, and farther pixels are lighter. 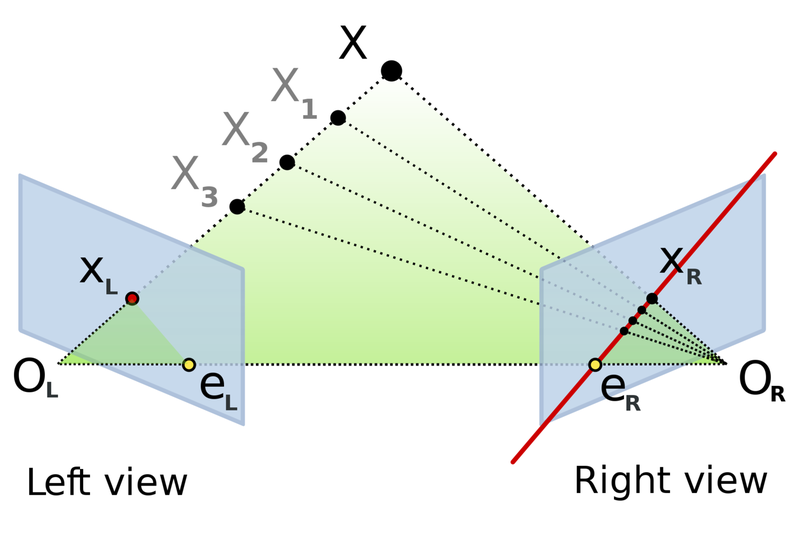 The last step to obtain a dense 3D point cloud is triangulation: given the correspondence (x1,i,x2,i), where xj,i is the i-th point on the j-th image, intrinsic parameters of the camera and camera poses, we can easily compute the 3-D point Xi in the world frame (see Fig. 5). The pipeline is very straightforward. All we need is a bunch of images, the corresponding camera poses, and the intrinsic parameters of the camera. Luckily ARKit provides all the information we need! So, why donРђЎt we give it a try on a couple of images taken using ARKit? Fig. 6: 3D dense point cloud obtained using stereo vision on four pairs of images and camera poses obtained using ARKit. Fig. 7: 3D dense point cloud obtained using stereo vision on many pairs of images and camera poses obtained using ARKit. Fig. 8: 3D dense point cloud obtained using our pipeline. Stereo vision works very well when images have a lot of features. However, in order to build an accurate floor plan, we need information on the walls, which most of the times donРђЎt have many features. In fact, if you look at Fig. 8, youРђЎll soon realise that walls have not been reconstructed at all, as it is very difficult to find correspondences on the wall if the wall looks the same everywhere. Unfortunately there is no way of solving this problem using only traditional stereo vision. In our next blog post, weРђЎll explore newer, deep learning-based techniques to obtain 3D information. DigitalBridge is committed to estimating room structure and creating accurate floor plans from scans. However, itРђЎs complex work! Our previous blog post explained how, starting from a 3D Point Cloud, we can get very accurate measures of a room, and today weРђЎve focused on how to retrieve the 3D Point Cloud. 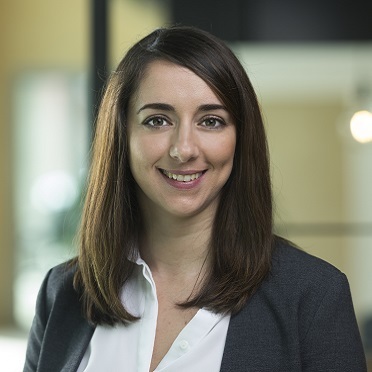 In particular, weРђЎve described how stereo vision can be used with ARKit to generate dense 3D Point Clouds and highlighted the main limitations of this method. ItРђЎs clear that stereo vision alone, given its limitations, cannot generate a point cloud that can be used effectively with our current room structure estimation algorithm. In fact walls, which are the main source of information to infer room dimension and shape, are usually texture-less, and therefore stereo vision cannot estimate 3D points from them. In our next blog post, weРђЎll explore newer, deep learning-based methodology to gather 3D information from images.